What's New for the 2018 BMW 5 Series? BMW adds two models - an electrified 530e iPerformance and an M550i xDrive - to the already-excellent 5 Series lineup. A leather dashboard is also newly available as a stand-alone option and drivers can upgrade to an Anthracite Alcantara headliner and full Merino leather. Some equipment packages have also been updated or revised for the new year. The 5 Series' trim levels are determined by powertrains. As you move up, you get more power and a longer list of available options. The four-cylinder 530i is the base trim followed by the new-for-2018 plug-in hybrid 530e. A powerful six-cylinder 540i comes next and is topped only by the brand new uber-fast, tire-shredding, all-wheel-drive-only M550i xDrive. An eight-speed auto-transmission is standard on all, and all-wheel drive (xDrive) is an option for the 530i, 530e and 540i. The base 530i comes impressively equipped with a plethora of standard equipment highlighted by 18-inch wheels, a sunroof, LED headlights, BMW's SensaTec leather upholstery and automatic wipers. Additional features include power-adjustable front seats, dual-zone automatic climate control, front-seat memory settings and a power tilt-and-telescoping steering wheel. It is also offered with the iDrive infotainment system with voice and gesture controls, navigation, a 10.2-inch display, and a 12-speaker sound system. 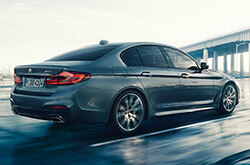 The same 530i comes with the same equipment but offers several unique design cues and an upgraded powertrain. The 530e iPerformance adds a charging-station finder and a standard rearview camera to the list. 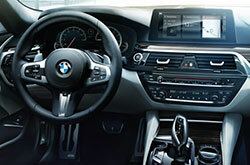 The top-of-the-range M550i xDrive receives an adaptive suspension, multi-contour seats with leather upholstery, a premium stereo system, and unique interior and exterior styling cues. There are also several performance and aesthetic packages as well as stand-alone features offered across the trims for an improved driver experience. The base 530i and the 530i xDrive (AWD) are fitted with a turbocharged 2.0-liter four-cylinder engine that pushes out 248 hp and 258 lb-ft of torque. They return 24/34 mpg city/hwy and 23/33 mpg* respectively. The plug-in 530e and 530e xDrive pairs a 180-hp, 255-lb-ft of torque 2.0-ltr engine with an electric motor to deliver a total of 240 horsepower and 310 lb-ft of torque. It records a 16-mile all-electric range and 29 mpg combined. The 540i and 540i xDrive boast a turbocharged 3.0-liter I-6 engine that churns out 335 horses and 332 pound-feet of torque. BMW claims a respectable 4.7-seconds zero to 60 mph run for both specifications. 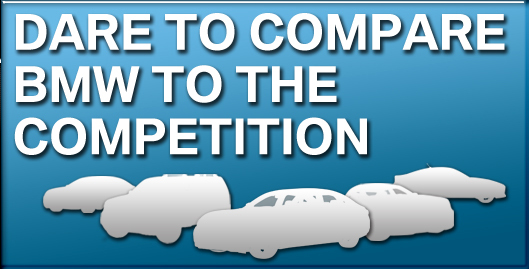 EPA estimates place them at 20/30 and 540i 20/29 mpg* respectively. Packed under the hood of the M550i xDrive is a 4.4-liter twin-turbo V8 that cranks out 456 galloping ponies and 480 lb-ft of torque. EPA rates it at 16/25 mpg. Expert road tests on the M550i xDrive support BMW's claims of a 3.8-second 0-60 mph run. The new model also makes it from naught to 100 mph in 9.2 seconds and reaches the quarter-mile at 115 mph in 12.3 seconds. The 2018 BMW 5 Series' available Driving Assistance Plus package complete with Frontal Collision Warning and City Mitigation enabled it to avoid 12- and 25-mph forward collisions. Also in the same package are Parking Assistant Plus, blind spot warning, a self-parking system, daytime pedestrian protection, a 3D camera, and lane departure warning. The 2018 model was also awarded received an NHTSA five-star rating for overall safety and is the IIHS' Top Safety Pick+. Explore the luxury and impressive performance of the 2018 BMW 5 Series. Stop by our BMW dealership in Lincoln to learn more about this luxury BMW sedan and to test drive one today!